As summer is coming to an end and I prepare to head back into my classroom to set it up for September, I know my time to share the story of my transformational week with the Reggio PLC is running out. There were four equally fulfilling days which followed this one, but Monday's journey was not quite finished when I left off last week's post with us returning from our walk in the woods behind Acorn School. 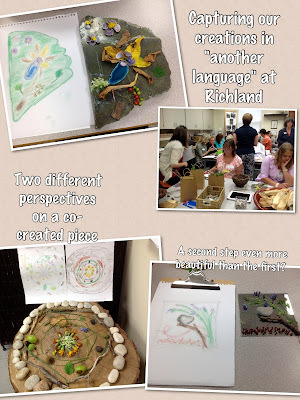 The final part of our wonderful first day with the Reggio Inspired Practice introductory summer course took place at the expansive, beautiful Richland Academy. My first post about this day looks a bit like a love letter to Acorn school, for indeed it is such an exquisite environment that one could easily get lost in the wonder. Richland Academy, just a 12-minute drive from Acorn School, is also a place of endless wonder. Our group did not explore the whole school on this or any of our days there, but instead were given glimpses of certain rooms. 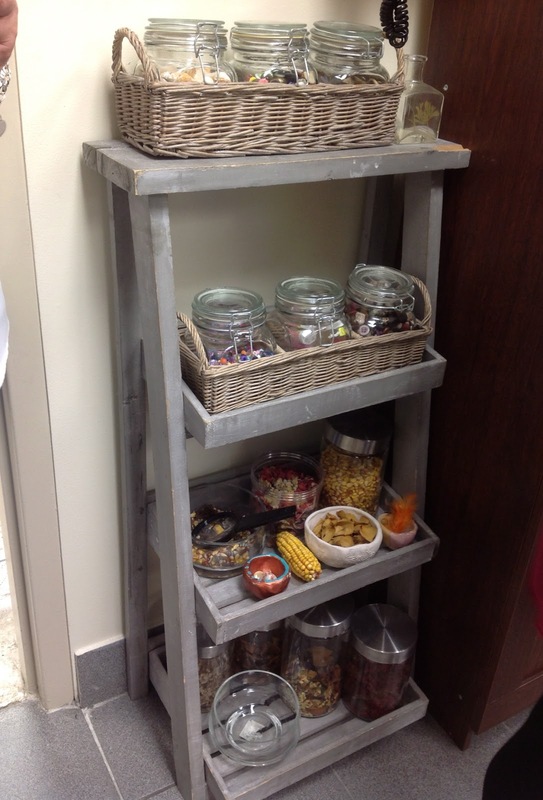 This was carefully set out so that we would uncover each new day's provocation as we came to "mess about" in that new room. It was a bit like an advent calendar of childhood: each day, awaiting a surprise behind another closed door. The promise of honouring the learners which hangs on the wall where you enter Richland School. When we arrived for our lunch at Richland, one of the first things I noticed in the large, light-filled expanse of the foyer was the large poster pictured above. This poem has taken on more and more significance for me as I delve further into my understanding of the message that Reggio Emilia teachers are trying to share with the thousands of visitors and even more faraway readers. As I allow myself to follow the lead of my diverse students, as I listen closely to their ideas and learn to ask better questions to keep the ideas flowing, I find myself more and more in tune with my students. 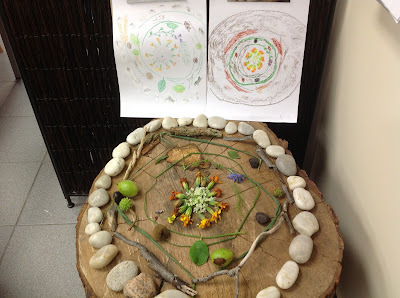 It is hard not to feel something akin to pride, even love, when you work so intimately with children as they invite you into their free-flowing creative thoughts. Anything seems possible when you are three, or four, or five. When you're open to this freedom, things that once seemed impossible to you as an adult slowly begin to look possible, and even likely. 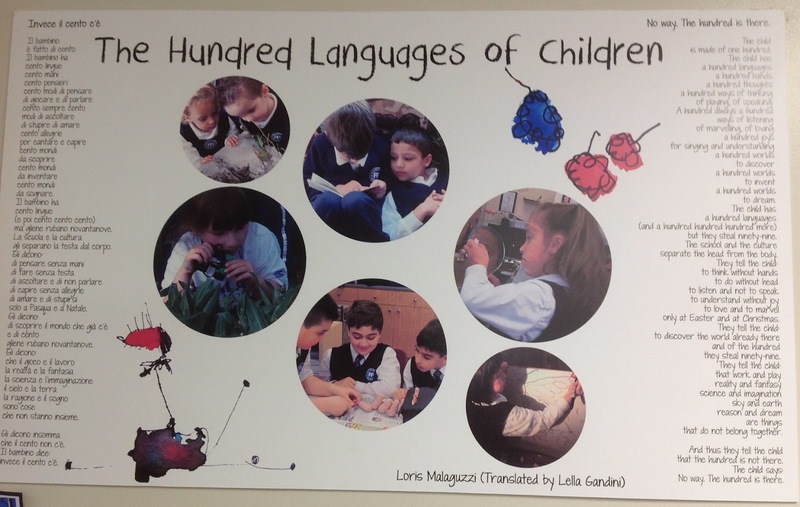 Reading the "Hundred Languages" helps me see the innate brilliance that children have in seeing things around them as they are, not as they should see them. A lost button or acorn cap or piece of string is not merely refuse, but a precious material to be saved, experimented with, treasured. A puddle is not a mere gathering of raindrops on the ground when you have rubber boots or a stick to float or a rock to drop. Testing the world around them is a children's very important work from an early age, and the poem cautions against turning the materials and places in the world into one thing each, one day of the year or one way of being used. So I paused to take a picture and read again, before heading to lunch. I thought: this is exactly the sort of school I'd like my kids to be at. I know now, after exploring much more around in the classrooms and outdoor areas, that it IS exactly the sort of school I'd like to send my children to, if we weren't so far away. After lunch together we gathered in the art studio or 'atelier'. The wealth of materials in that room instantly impressed me. 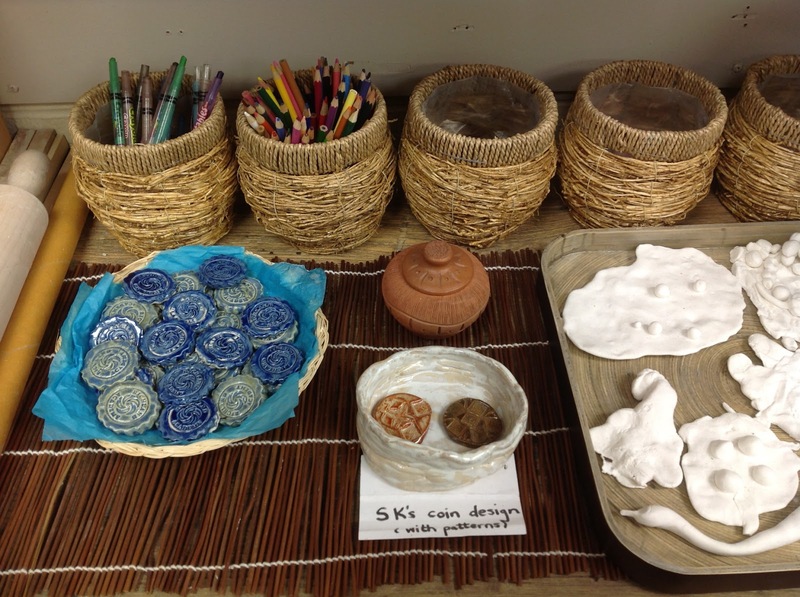 Everyone seemed to let out a gasp upon entering to see our first invitation to play: tables laden with art materials and loose parts, shelves bulging with jars, works in progress, and materials to touch. Walls covered with beautiful creations and provocations such as the lovely books above. 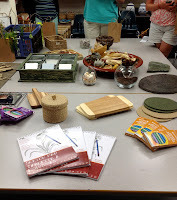 We each found our little brown bags with the natural materials we'd gathered on our walk that morning, and soon we would be invited to use our found items with the materials present on the tables to explore the elements of design: line, texture, colour, form, rhythm, balance, and more. Before we burst open our bags and pored over the goods all around us, though, Louise brought out a book to share. I couldn't help but smile, because it was the artist whose works have inspired me since I first learned about him in teacher's college many years ago. I've written about his inspiration several times now. Andy Goldsworthy's ephemeral art work features natural materials in outdoor environments. His explorations of the features of water, ice, grass, leaves, stone, wood and more often seem impossible when first looked at. 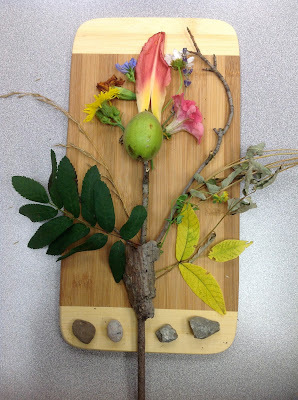 It is his ability to awe that leads me to use his works as provocations for my students, and when playing with adults in exploring loose parts art. 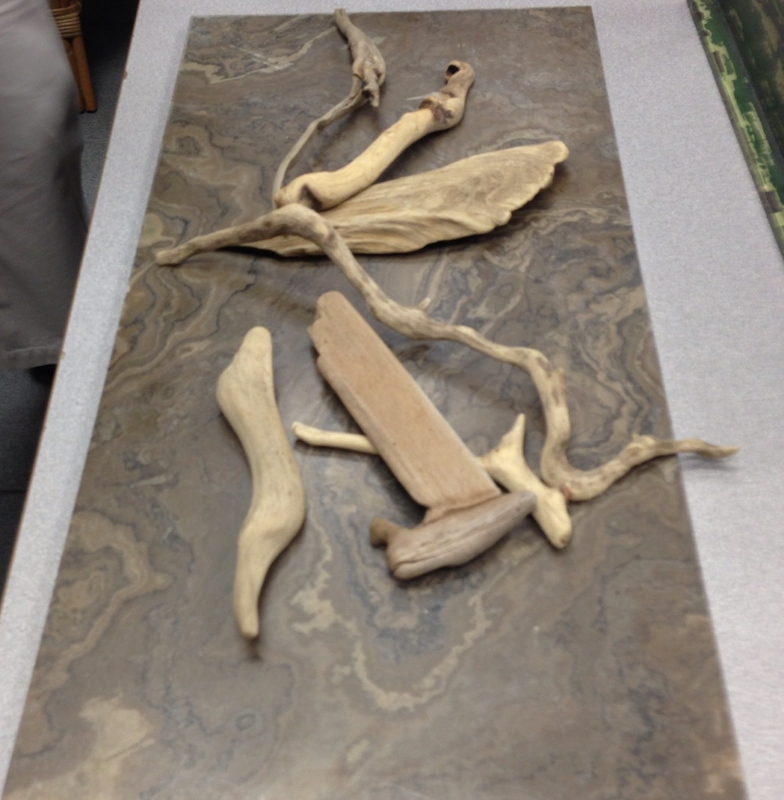 His materials also often leave no trace, so when the moment is gone, so is the experience. This type of work, the process being valued over the product, is the reason his creations always seemed so subtle and yet so outrageous to me. His works have oft-repeated forms (spirals, concentric circles, parallel lines, waves, sharp edges) that show up in an amazing array of natural materials, some arranged so poignantly that one can't help but wonder at the audacity of the artist to try something so difficult. I felt a connection to the activity, the book, and indeed to Louise as she explained her reasons for sharing this particular artist. Louise smiles as she finds another image to "wow". 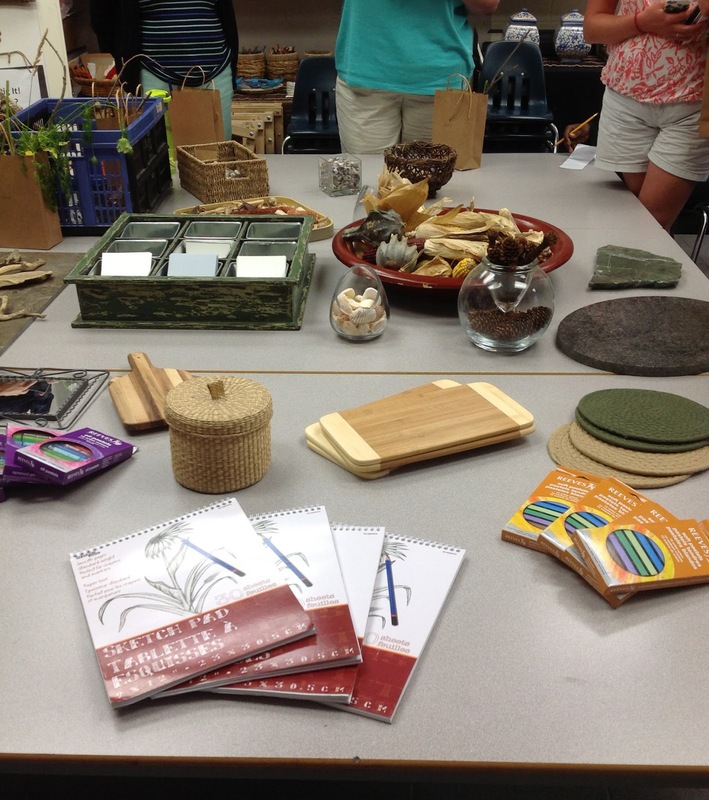 Thus inspired, we participants opened our gift bags and began to explore the materials anew. 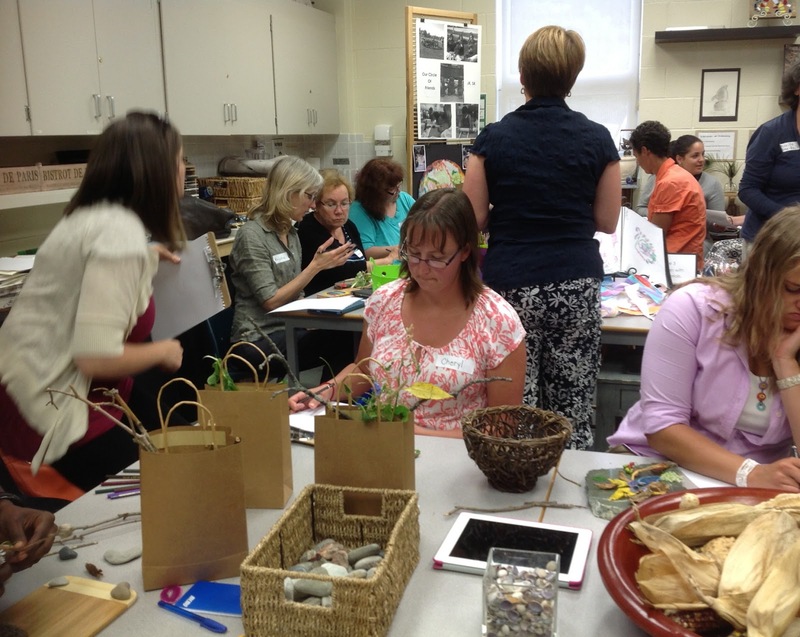 The room took on a hush as everyone got deeply involved in creating something beautiful. Most chose to work alone, but as Julie and I had gathered together we chose to work together. 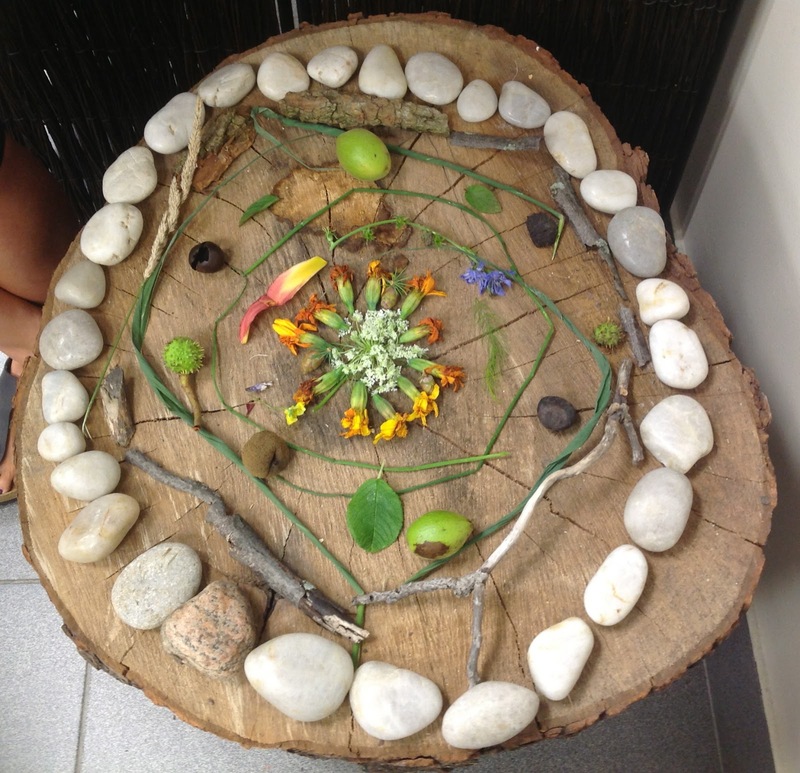 We found a particularly inviting stump on which to work, and there we created our multi-sensory mandala. Once finished, we looked around at the wonderfully unique creations taking shape all around the room, before moving on to the next invitation, which was to capture in 2 dimensions an image of what we'd made with 3-dimensional materials. Before reflecting on the meaning of this next phase, I'd like to share some of the images I captured. One of the things that struck me as I looked over the tables was that the form of the creation almost always took the form of the chosen frame or backdrop. It seemed as though we each found a frame or a place in the classroom that showed potential, and let it steer the direction of our placement. *Because I was so enthralled in the task, I didn't manage to see all of the work happening around the room. 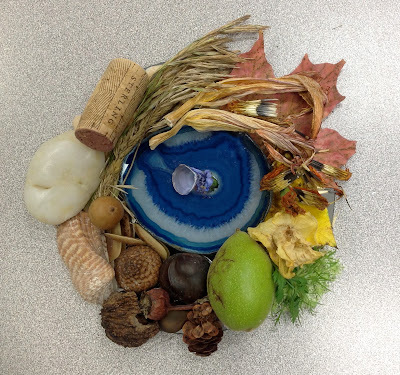 I am grateful to the Reggio PLC photo sharing, and have credited several photos here when not my own. Our mandala, ripe with the scents of flowers and nuts, rich with the contrasting textures of soft stones and prickly bark. For me, working with materials involves using all my available senses, not just a visual aesthetic experience. 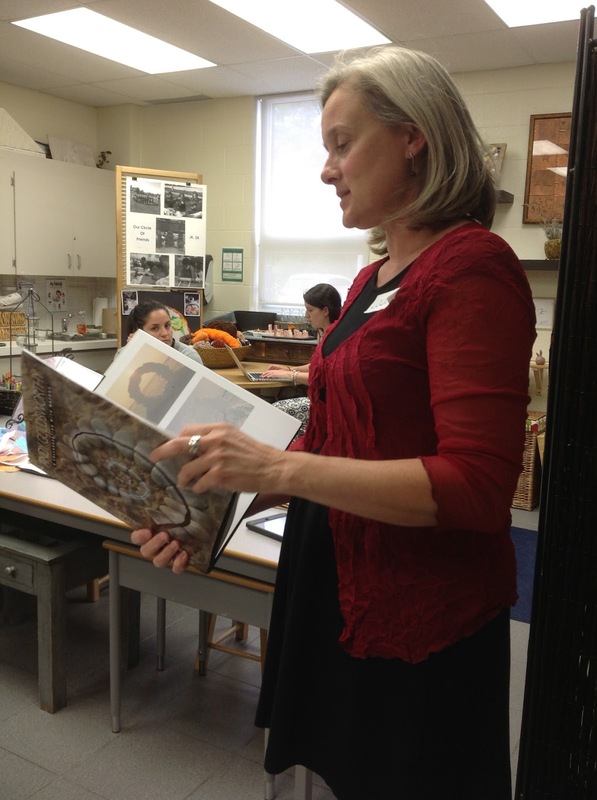 Reggio Inspired PLC deeply involved in our task. 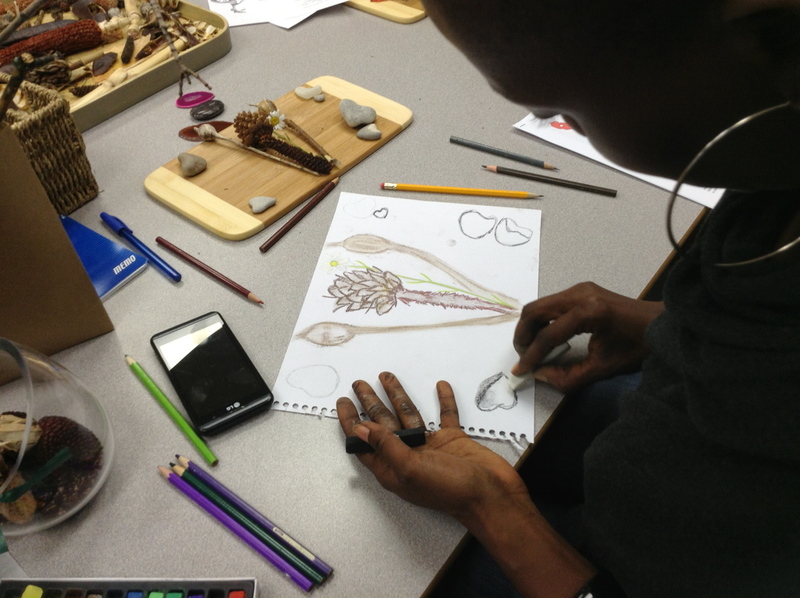 This activity made our own learning visible: moving from one way of interacting (gathering outdoors) to another (playing, organizing just so, to create something beautiful) and then drawing (using pencils, markers, charcoal). This was an example of just a few of the hundreds of languages of experience and understanding we have as humankind. In working in multiple languages, we deepen our understanding of the materials and our motivations for using the materials (including choice of framing element). 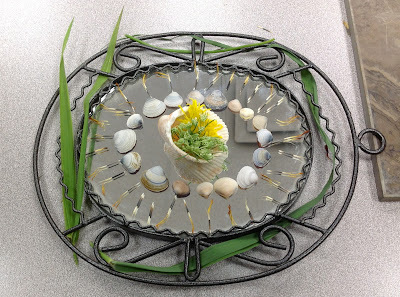 Thinking about how to represent our structures was like thinking about our thinking - reflecting upon our choices again and again made certain we would remember this activity for a long time to come, and be able to relate to why it was so powerful. I understood the poem more than a little better at the end of the day. I especially appreciated that Julie and I worked together, because it made the last step so fascinating: we looked at the same object and yet came up with such different representations. The details I chose to focus on were so different than hers that our results were naturally unique. The way that each work seemed shaped, directed in a way by the placement of materials on a frame (a circular mirror or stump, rectangular board, on the wavy grain of marble, the organic curves of a piece of stone) was once again an echo of that post-modern idea: the way you see is deeply swayed by where it is you are when you look. Your environment shapes your responses to experience. In a very real way, this activity allowed us to interact with our environment. For someone who has long ago given up the idea that each teaching has "one right understanding, one set of right answers", this process was very rewarding to see unfold. 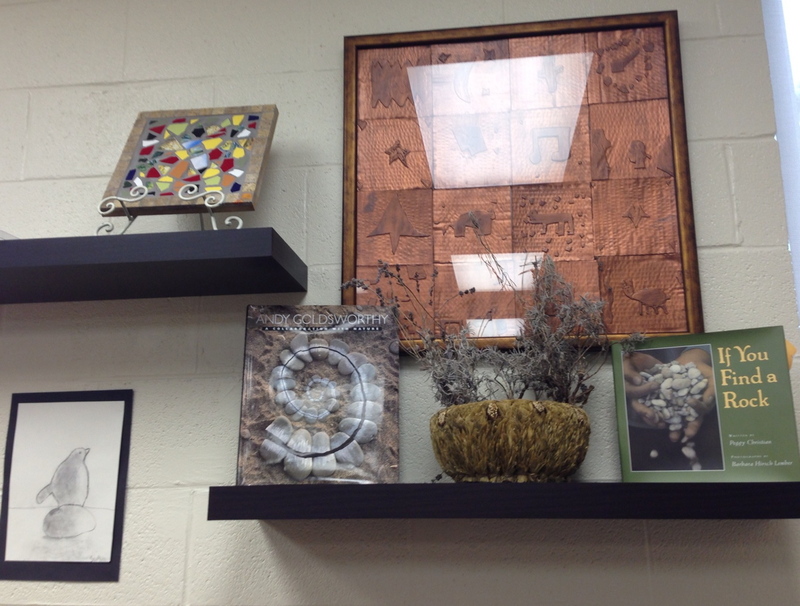 My picture, on the left, with the emphasis on the concentric circles and the lines within each element of the piece. Julie's picture on the right captured the colours and textures first, including the rich brown background of the stump. 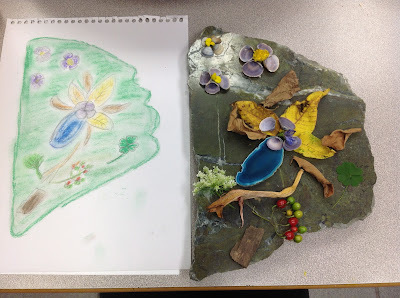 By choosing different materials to represent our sculpture (I drew first then added colour, Julie used the pastels straight away) our representations came out rather distinctly. This activity, on the surface, might seem to be solely an artistic exploration. But that is missing the many languages or modes of thinking and acting we were able to play with on this day. For me, a sensory aesthete, my primary modes of learning were activated from beginning to end. Within our group we had artists (you need only look at their representations to see this!) for whom translating the experience onto paper was not a difficult task. I always feel a bit stunted, like I have two left feet, when trying to capture an experience this way. A camera in my hands, or words, and I can tell you in great detail how I felt. My musical family might share lyrically or melodically. Participating in the activity in many ways, then, allows us to tap into our strengths and also experience new, less familiar ways to express ourselves. I leave off this post with the response I posted on the "Technology Rich Inquiry Based Research" blog post about the course. I read it again this week and realized it captured the elation I felt when I realized how transformational the course had been for me. "What you gave us in structuring a week of “messing about” was invaluable. I read above your description of how some participants expressed initial discomfort with not knowing the direction of where the play would lead. 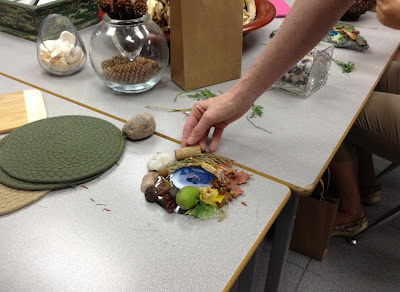 What the provocations (instead of “lessons”) do so brilliantly is to allow each player to interpret the meaning and relationship between various materials. This, unlike the PowerPoint or teacher talk, doesn’t trigger cognitive dissonance. I mean, hearing about how to structure your classroom in a way so totally unlike the traditional, perhaps comfortable method can’t help but trigger an emotional response, even amongst educators who embrace a playful day in their teaching. But giving us time to explore, touch, manipulate, talk, create, talk more, and play… is powerful. And then giving time to talk about it together, to reflect of people’s questions and noticings? Such good modelling for how we can do it daily in our classroom. Tying the theory in with our readings during debrief time made the theory come alive. You all did manage to offer a course while following that most important idea: “nothing without joy”. I’m sure I’ll read this again and see more, but for now, I just wanted to thank you again for a wonderful week. I feel very much at home with my ReggioPLC".